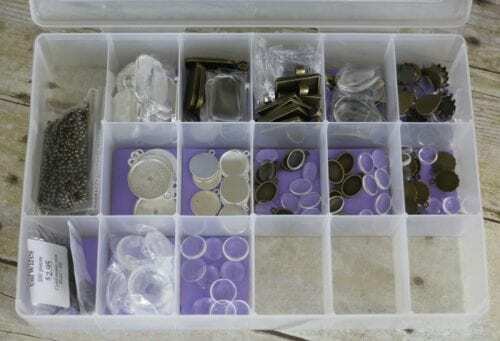 A simple way to organize your jewelry making supplies so you know what you have when you DIY jewelry! An easy DIY craft tutorial idea. Do you like to make your own Jewelry? Do you have beads, clasps, and chains in a jumbled mess shoved in a box somewhere? I love to make my own jewelry but finding what I had and what I needed was becoming a chore and I stopped making it because sorting through all of my supplies was becoming such a pain. I didn’t know what I had and what I didn’t. It was time to do a little organizing so I could get back to my jewelry making. Begin by measuring the size of the compartments in the plastic storage container. Depending on the box you use the dimensions may be different from mine so don’t use my measurements, but measure your own. These compartments are 4 x 5.5 centimeters. You can see how cardstock cut down to that size fit perfectly inside. Cut as many rectangles as needed for your storage container. Write on the rectangle what will go inside that compartment. Put the rectangle inside the compartment with the writing facing down, then put the supply on top of it. When the box is closed you’ll be able to turn the container over and see what’s in the storage container at a glance. And don’t worry, the compartment walls go all the way to the lid so even if you have tiny seed beads in a compartment they won’t get mixed into other compartments. 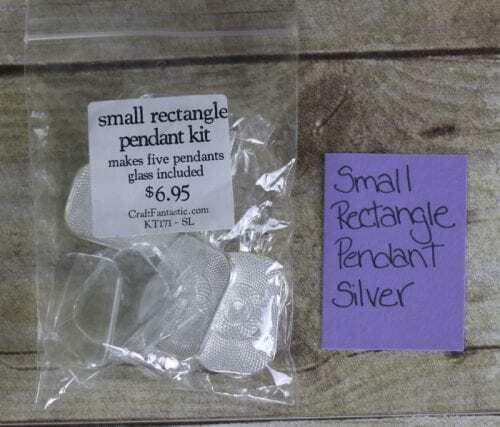 For this particular case, I was organizing my jewelry making supplies from Craft Fantastic, but this technique works for any beads or jewelry findings. Do you organize your beads in a different way? Share and leave a comment below and let us know how you do it differently. SAVE HOW TO ORGANIZE YOUR JEWELRY MAKING SUPPLIES TO YOUR FAVORITE DIY JEWELRY PINTEREST BOARD! Great idea! I use a similar organizing system. 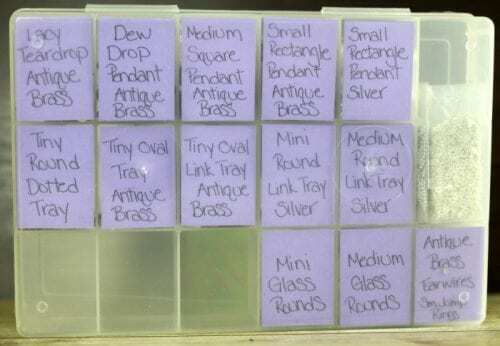 I use the same box types, each one is organized by color and then I use my label maker and print whatever bead/finding and stick it to the top of each box. I have just about every brand of plastic box and I find that if tipped stuff still seems to get mixed. However, now I have SO many storage boxes that it’s become too difficult to lay them all out and open them up to see everything I have when creating as I go along. I’ve been looking at different organizing/storage ideas (love the use of old letterpress cabinets, but SO expensive!) And would be interested to see an article about ‘moving on up’ (so to speak!) to the next level of bead organizing. I find these in fishing tackle section at the dept stores or sporting goods much cheaper than the craft supply stores! They are the same! I use pot dividers mounted on wall. The “tackle boxes” fit perfect! Mine will now get labeled like your idea!